一個充滿能量與熱情的全方位設計公司, 以人文, 創新與數位整合的設計思維與空間創作為出發,透過空間的力量與手法來面對環境的議題,尋找一種空間感官的平衡, 將人, 自然與生活融合為一, 試圖在建築, 室內, 景觀到數位的領域中落實一種兼具在地人文內涵與國際觀點的空間作品. An international design firm focusing on strategy, architecture and design for architecture, interior and exhibition projects,the team has a wealth of experience and comprises architects, interior designers, decorators, graphic designers and digital experts. Built on a hillside, the home intentionally elevates the living space to provide privacy while offering a comfortable outdoor activity space for families. A curved wall running through the building defines the exterior and interior, separating the public space from the private. By using big roof to merge outdoor nature and indoor life in order to symbolize "living under one roof"
Facing a beautiful scenery of green hills, the building features staggered balconies that extend the indoor living space to the mountain landscape, offering a connection with nature that brings a sense of fulfillment to daily life. 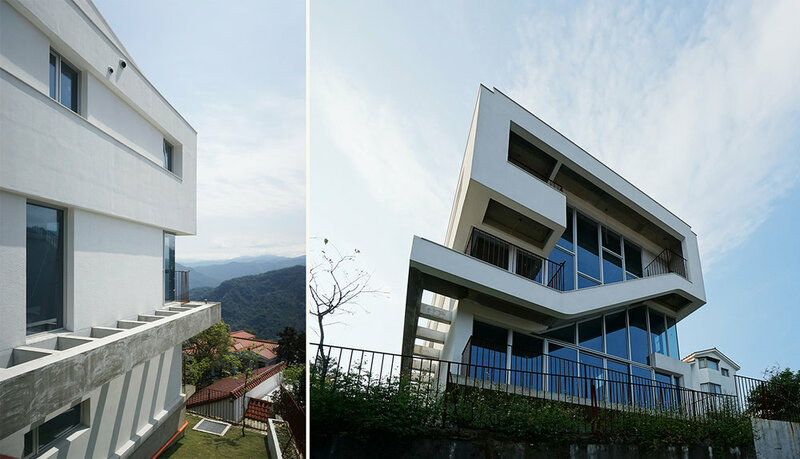 Hwasoeng Villa locate in the corner of hill, Because of terrain, Villa's entrance start with second floor and continue into interior space. Interaction between people and space start from street and move horizontally into villa where is mountain view area, start with back of building space move vertically go through villa. House locate in the mountain area quietly like a nature stone, and provide resident living aspect as time goes on. Interior space provide by living aspect and nature light, The opening provide interior space nature view from different directions. 建築坐落于台灣東岸一望無際的稻田地景上, 像是土地裡長出來的空間, 樸實而靜抑. 使用著在屋頂與大地之間漂浮的平面上生活著, 四面都是土地與自然, 家 就是一處可以遮風避雨的自然之處, 既是室內也是戶外. House surrounding by the paddy field locate in the east coast of Taiwan, House hidden in the field just like it growing from the earth. Soho house is a multi-function building which provide residents living and working space, therefore, residents can adjust the proportion of working-time. The design is inspired by the Scriptures. The arrangement of space reinterprets the role of the church in the community and in people’s minds in this fast-changing era. Building locate next to a park facing landscape and plaza, residents can always feel breeze path through. “行雲流水” 是我們空間設計上的主要概念, 希望透過一個自然的意象來作為空間設計的主軸, 轉畫自然中的水流, 風, 與雲的意象成為設計的主要元素. Water symbolizes life. the most vivid and subtle rhythm of water lies between the rhythms and the aftertones, the invisible and the visible, while embodying an endless and rising amount of energy. derived from the water and transformed into a spatial embodiment of water, this design aims to reinterpret a contemporary public space within a residential arena. This residence belongs to a couple that relocated back to their hometown after spending many years in the United States. 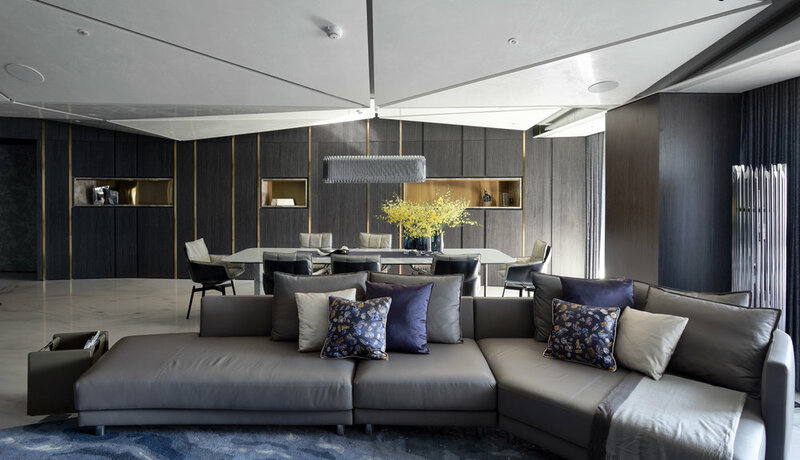 Its design is an attempt to mix the “Eastern connotations” from their upbringing together with traits derived from the “Western spirit”, resulting in a living space that reflects the individuality of the owners. At the same time, it combines Western modern mastery with the distinguished characteristics of Eastern inner-balance.